63 For Perbreaking and for fluxe Seethe roses in vineger or gaules and while it is hot wet therin wooll and lay it to ye stomake for vomit and on ye navill for fluxe and on the reines for appetite. 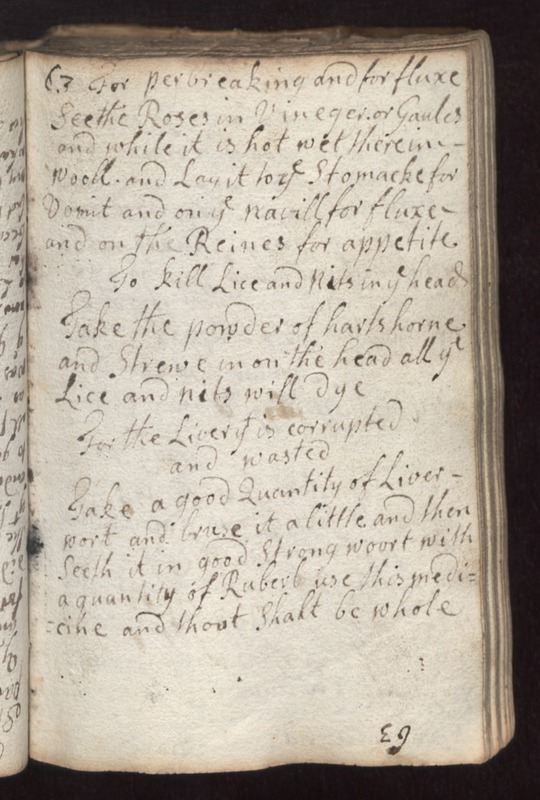 To kill lice and kits in ye head take the powder of hartshorne and strewe in on the head all ye lice and nits will dye. for the liver ye is corrupted and wasted take a good quantity of livewort and bruse it a little and then seeth it in good strong [woort?] with a quantity of ruberb use this medicine and thout shalt be whole.